Bavarian Performance Group (BPG) was founded in 2004 in Stoneham Massachusetts. BPG moved to Winchester MA in 2007 outfitting their new building with the latest and greatest tools and equipment to service your BMW. BPG prides itself on only offering original BMW parts. While our prices might seem high upon initial inspection compared to mom and pop gas stations, we use only the highest quality BMW original parts that are backed by BMW with a two year unlimited mileage warranty. Beware cheap knockoff parts, they are not covered by warranty and are of inferior quality. Yes you save up front but often times end of with sub-par performance, shorter part life span, or a more expensive repair bill down the road when these inferior parts fail. Unless your BMW’s parts are being delivered from a official BMW dealer and are in BMW packaging, they are not BMW original equipment parts. Compared to having your BMW serviced at your local BMW dealership we are a bargain. Because we do not have to maintain a massive facility with an excessive staff we do not have to charge $150 an hour or more to service your vehicle. 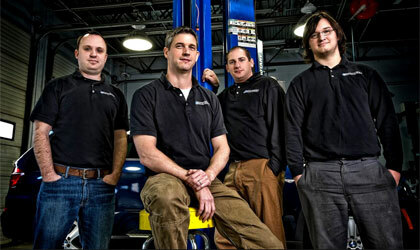 Our Master Technician is BMW certified and BMW dealer trained. Bavarian Performance Group can perform all the required service, maintenance and repair for your BMW. We are committed to using only the highest quality BMW Original Equipment parts, fluids and accessories in your BMW. All of our repairs covered by a two year unlimited mileage warranty for total peace of mind.Bavarian Performance Group is an independent shop that specializes in BMW service and repair. Located in Winchester, Massachusetts, we are only minutes from downtown Boston. Every time that we perform any service, repair or maintenance on your BMW, our experienced personnel are working to ensure that your vehicle is safe and reliable. The value added benefit of our services is our professional experience with the problem areas, pattern failures and the practical service needs of your particular model BMW, just like the BMW dealer. “Thank you for your complete assessment of repairs for the bmw. Looks like she needs some tlc. After talking with you today I am confident I found the right place to call our BMW service friends.